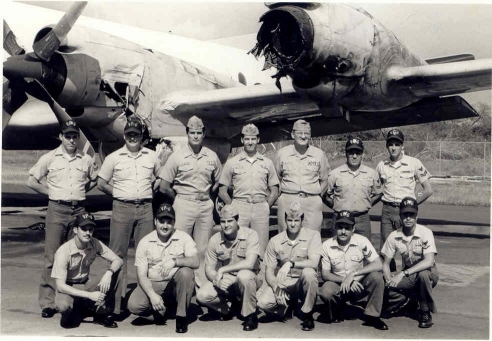 Left to right, front row, AXAN Gray, AOAN Swindler, LT Musmansky, LTJG Shirley, AW2 Smith, AT3 Braswell. Left to right, back row, AW2 Small, AD1 Mullins, LT Laufer, LT Koshiol, CDR James, AMH2 Addoms, AW2 Peters. Following a seven-hour P-3 ASW patrol, VP 6's Crew Eight (PPC LT Koshiol, copilot LT Laufer and flight engineer AMH2 Addoms) initiated restart of the loitered No. 1 engine, 830 nm from NAS Barbers Point. All initial restart indications were normal. As the fuel and ignition switch was placed on, engine rpm climbed rapidly through normal 100 percent rpm, stabilizing with an audible 105.5 rpm overspeed. 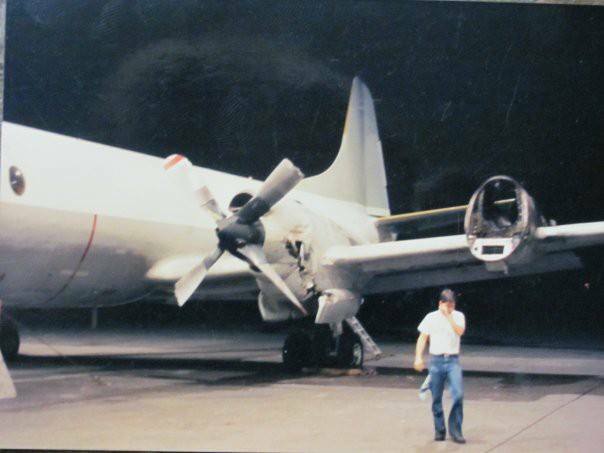 The emergency shutdown handle was pulled in accordance with NATOPS, but the prop failed to feather. The crew executed emergency procedures in an attempt to get the prop feathered but with no result. The crew discussed their options. Moments later rpm surged to gauge limit, 125 percent rpm, actuating the propeller/engine safety decoupler. With the initial overspeed and subsequent decouple, the prop was now fixed-pitched and windmilling with rpm a function of TAS. To maintain prop rpm within design limits, airspeed was limited to an agonizing 150 KIAS. Over the next two hours, Crew Eight struggled to keep the rpm within limits while navigating around imbedded thunderstorms, encountering icing and moderate turbulence. The flight station coordinated with the mission commander, CDR James, who initiated emergency clearance to NAS Barbers Point and coordinated tactical crew efforts in preparation for a possible ditch or bailout. Following two hours of laborious transit, No. 1 engine developed oil quantity problems, which resulted in oil spewing from the engine, depleting engine oil quantity to zero. ETE to the closest field, NAS Barbers Point, was two hours. All crew members were removed from the prop's plane of rotation in anticipation of gearbox failure and prop separation. Over the next two hours, the airframe was periodically raked by cyclic vibrations as the gearbox disintegrated internally. One hour later a chips light illuminated on No. 1 engine followed by a tach generator failure. The rpm was now solely determined by sound. At 120 nm from NAS Barbers Point, the crew began a 100 fpm, 150 KIAS descent in order to minimize attitude change on the deteriorating prop/gearbox. Several minutes later vibrations increased, with white sparks and traces of smoke coming from the tailpipe. Moments later the No. 1 fire warning light illuminated, and the No. 1 HRD was discharged. One minute later the fire warning ceased. Only No. 2 engine's HRD remained for backup if No. 1 caught fire again. At 40 nm LT Koshiol observed a 1-inch gap between No. 1 prop and its afterbody. No. 1 was slowly walking its way off the deteriorating gearbox. Five minutes later, No. 1 fire warning illuminated again, accompanied by sparks and smoke billowing from the tailpipe and nacelle access doors. At LT Koshiol's direction, No. 2 HRD was transferred and discharged into No. 1 engine. Fire warnings ceased five seconds later. At 12 nm approach, flaps were selected, and rate of descent was slightly increased to establish a steeper than normal glide path. Moments after the descent was established, the gap on No. 1 prop increased to 3 inches. The crew reported No. 1 prop was about to depart the aircraft. At 9 nm the No. 1 prop slowly walked forward, pitched down and departed the aircraft, striking the No. 2 prop, severing 15 inches off symmetrical blades and cutting into the No. 2 nacelle before falling below the aircraft. No. 2 engine rpm decayed to 80 percent with the fire warning blaring. No 2 E-handle was pulled, but the prop failed to feather, windmilling at 10 percent rpm. With no fire extinguishers left, the fire warning horn was cancelled. 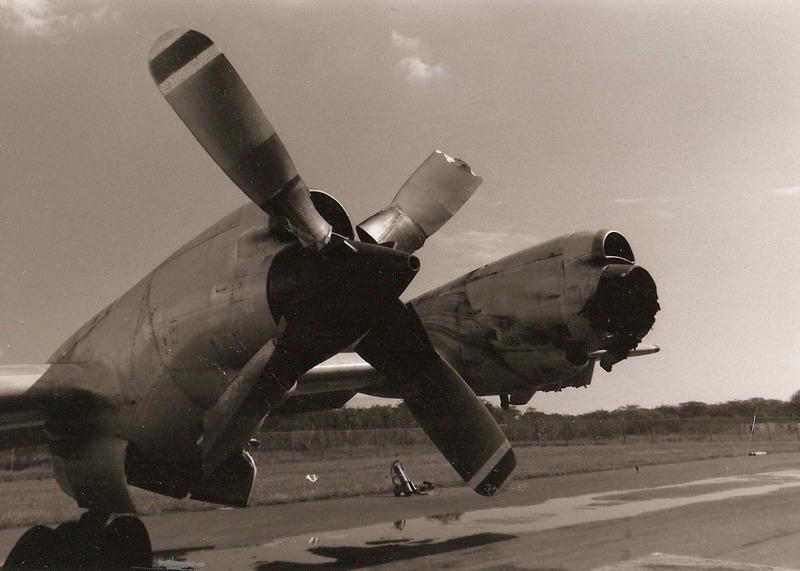 The windmilling prop created severe drag as the aircraft rolled violently to the left. LT Koshiol and LT Laufer wrestled to control the aircraft. The prop brake finally actuated, stopping No. 2 prop rotation. With the prop stopped, control improved, and LT Koshiol set up for a straight-in to runway 4L. As previously briefed, LT Laufer held the gear until 1,000 feet and the landing was assured. At 1,000 feet the gear was extended with LT Laufer reviewing the landing checklist complete. Moments later the aircraft touched down on centerline, 2,000 feet down the runway, completing its landing roll-out with 2,500 feet remaining.